Lonnie and Mabel Hamlin took out a $10,000 mortgage on this property in 1928. That would strongly suggest the house was built that year. On the 1980 picture a door appears to open onto the roof porch, later enclosed with a bannister. Was that a usual practice when the house was built? Glad to see it is being restored to its original appearance - good looking house. 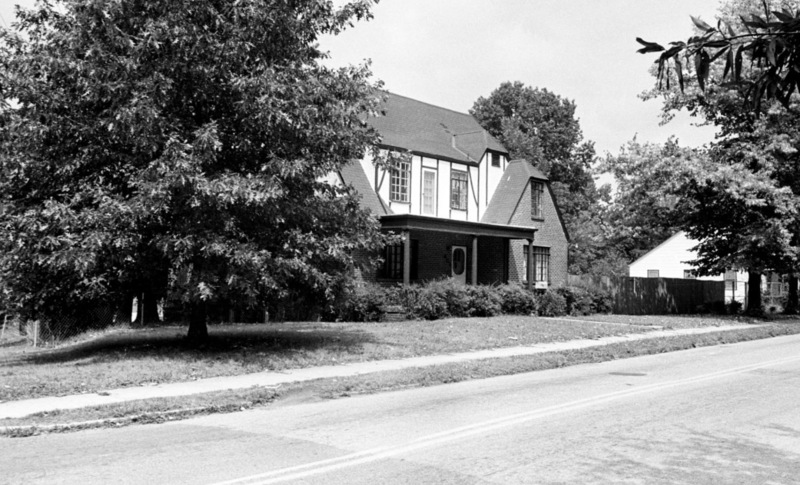 The large flat-roofed front porch is very atypical on a 1920's Tudor Revival. I've looked through hundreds of pictures and plans in books and online, and I can't find another. Tudors were typically designed with very steep roofs (as this one has) and therefore a flat roof, even on a porch, looks out of place. They usually had small entrance vestibules. If there was any kind of front porch, it normally had a steep roof as well. Since Tudors didn't usually have flat roofs, second-story doors were equally uncommon. That said, I'm beginning to think the door and the porch are original. Since the Hamlins appear to have built the house on land they already owned, this house was not just a builder's spec house that followed conventional plans. I surmise that they wanted a second story porch. But as you noted, the railing was not put up until comparatively recently. Spending time on a second-story porch without a rail would give me the willies, but perhaps they didn't mind. The doorway, by the way, is off the master bedroom. If other readers of Open Durham have ideas about this house, or have seen something similar elsewhere, I'd love to hear about it. In 1912, Lonnie Hamlin and his wife Mabel are listed at 308 N. Elizabeth Street. 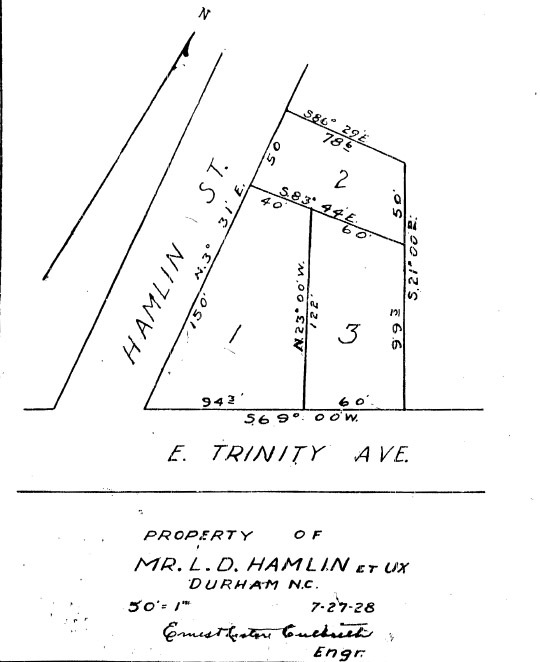 They appear to have lived at this address only briefly; in October 1913, they purchased property (two separate lots) on the corner of "an unnamed street" (which would become "Hamlin Street") and Trinity Avenue. Given that they paid $3000 for the property, it seems likely that a house had already been constructed on the property. The property was party of Brodie Duke's holdings, which were subdivided and sold by the Duke Land and Improvement Company - this property had been sold by them to Anna M. Murray in 1909. The next available city directories show Mr. Hamlin and his wife Mabel living at the address. 1919 CD: Hamlin, LD (letter carrier, Post Office) 401 East Trinity. The property was subdivided in 1928. It appears the house above was constructed at that time, both based on the architecture of the house as well as the mortgage taken out by the Hamlins at the time. It's not clear whether the "401 East Trinity" that the Hamlins lived in prior to 1928 was replaced by this house, or whether that house was extant on "Lot 3" and Lot 1 had been vacant prior to that time. Lonnie Hamlin died on 01.23.32 and is buried in Maplewood Cemetery. Courtesy: Charlotte Hamlin. 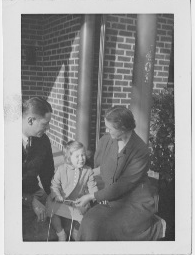 This picture c. 1946 shows Mabel Hamlin (right) with her son, Bill Hamlin (left), and granddaughter, Charlotte Hamlin (center) sitting on the front steps of 401 E. Trinity. Note the original round columns behind them, which had been long since replaced when the present owner acquired the house in late 2011. Courtesy: Charlotte Hamlin. 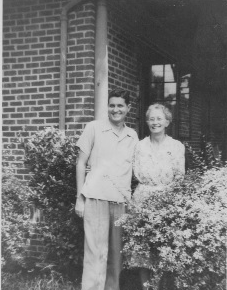 Mabel Hamlin and her younger son, David, standing beside the porch at 401 E. Trinity. Notice that the casement windows behind them are open. Labor Day, 1947. 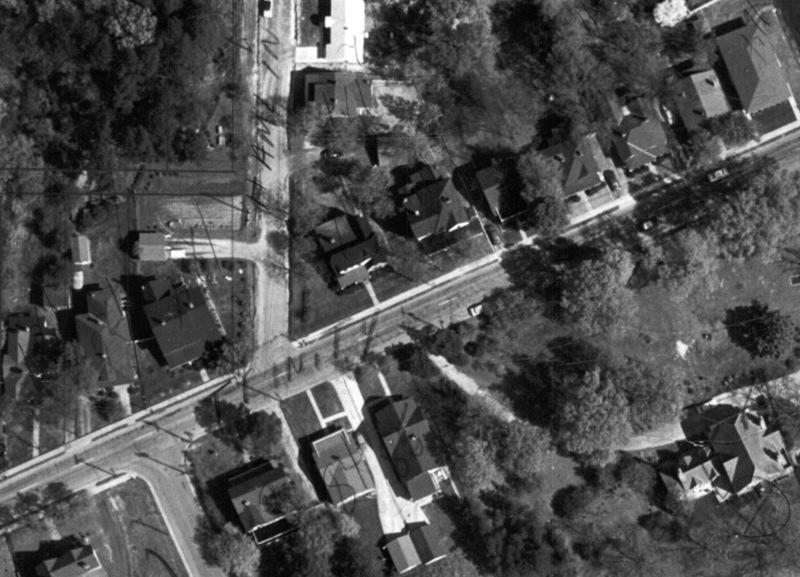 1959 aerial showing the corner of Hamlin and East Trinity. Hamlin Street was later renamed as Rosetta Drive. Mabel Hamlin is listed in the city directories as living at 401 E Trinity until 1966; she died on 03.11.68. In 1967-68, it is vacant, and by 1969, it had been subdivided into apartments. In recent years, as of 2011, it has been four apartments. The exterior has had various vinylization and other out-of-place oddities added to it. It has recently been purchased; the current owner is in the midst of restoring it to a single-family dwelling as of November 2011. In 2006. Note the absence of any sort of railing around the second-floor porch, which also appears to be sagging. 11.06.11 Someone put an architecturally inappropriate railing on the second floor porch between 2006 and 2011. They didn't really repair the porch, which was rotting out. 11.26.11, with vinyl and other later additions removed, re-exposing the half-timbering.